OVERALL: The Amana AFI2538AES has one of the higher consumer rankings. We found this Amana French Door Refrigerator to be one of the best in the Amana Refrigerator line. Some of the features which impressed us most were the exterior control pad which allows easy adjustment of temperatures without opening the doors, the EasyFreezer™ pull out drawer with EasyClose drawer rack system which rolls open and closes smoothly, and FrontFill™ dispenser easily and quickly fills tall containers with filtered water and ice simultaneously. : The Styling of this French door refrigerator combines bottom freezer design with contoured twin refrigerator doors, offering style and convenience for any kitchen. These twin contoured refrigerator doors are sure to turn heads. CAPACITY: With 24.9 cubic feet of space, we found this Amana refrigerator to be more than ample for a family of four. The wide refrigerator doors made storing awkwardly-sized dishes easy and convenient. NOTABLE FEATURES: Some of the features we liked most were the Max Cool feature which chills large amounts of food in the shortest possible time; the Temperature controlled Beverage Chiller™ compartment which stores milk just a bit colder than the rest of the fridge. And of course the PuriClean II retractable water/ice filter. COLORS: Our unit came in a Stainless Steel finish which stood up well to fingerprints and scratches. The finish was very easy to clean as well. 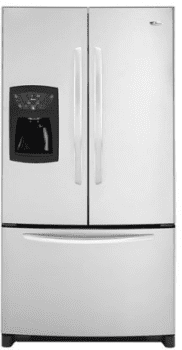 MSRP: While the MSRP of this fridge was $2,800.00 it is no longer being made and is now discontinued. Unless you are looking to fix your Amana AFI2538AES we would guess that buying a discontinued or used refrigerator isn't something that you came to Refrigerator Pro for. No worries, we are constantly updating our reviews to find new, updated versions to replace those that have been made in the past.